Human beings need regular exposure to sunlight on their skin so that they can make vitamin D which is vital for health. Yet the British government advises the public to “cover up, keep in the shade”. This advice is mistakenly modelled on a programme developed in Australia where a tropical to Mediterranean type of climate provides much more vitamin D. Faulty calculations made by the National Radiological Protection Laboratory have misled UK government advisers into thinking that casual exposure of hands and face to the sun in the UK will provide sufficient vitamin D for health. In fact casual exposure does not provide enough vitamin D in the British Isles and the majority of people in the UK have an insufficient level of vitamin in the blood, particularly in winter. The risk of skin cancer from sun exposure is much smaller than the public has been led to believe while the risks of vitamin D deficiency or insufficiency, which are seldom mentioned, are now known to be very substantial. Insufficient vitamin D at crucial times of life or for prolonged periods appears to increase the risk of several cancers, including breast and bowel cancer, diabetes, high blood pressure, schizophrenia, multiple sclerosis and many other chronic diseases including even tooth decay. The UK government campaign for prevention of skin cancer, led by Cancer Research UK, has in effect been a campaign against sunbathing. Perhaps its most misleading aspect has been the slogan: “There is no such thing as a healthy tan”. This ignores evidence that people who have a deep tan are less likely to get melanoma, the most serious form of skin cancer. While people who get sunburnt, an indication of extensive exposure to the sun, are less likely to get multiple sclerosis or prostate cancer. 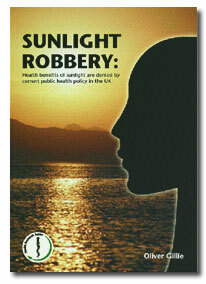 Oliver Gillie’s report, Sunlight Robbery, explains how government policy has gone badly wrong and urges people to sunbathe whenever they can, wearing as few clothes as possible, while taking care not to bake or burn. Download a copy of this report free (click on right). To buy a bound copy please write to the address below enclosing a sterling cheque or international money order. Prices shown below.